A collection of modern works for solo French horn, performed with absolute aplomb by master hornist Douglas Hill. 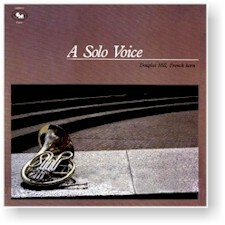 From rigorous to humorous, A Solo Voice is an album for the horn player and lay listener alike. "Superb artistry ... as great a coverage of compositional styles of serious music as I've heard on any horn recital." Not currently available on CD. Recorded in December 1985 in Houghton Chapel at Wellesley College in Wellesley, Massachusetts.